No one has experienced the Oprah effect quite like Uwem Akpan, author of Say You’re One of Them. I had heard of the book previously from a friend, thought it had a catchy title but that was it. Cue a mention by the phenomenon that is Oprah (Fattening for Gabon is her favorite story), the prestigious title of Oprah Book Club Selection for 2009 and lo and behold, this book rises from mediocrity of having only sold 31,613 copies since July 2008 to being one of THE MOST coveted books on Amazon. 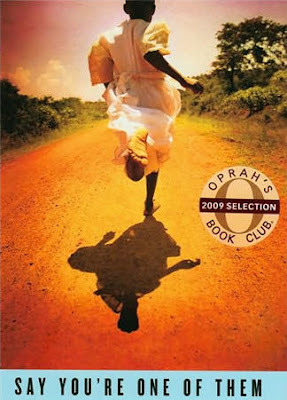 Oprah had never selected a collection of stories for her book club before; neither had she ever chosen a Nigerian. Infact Uwem Akpan is the first living African fiction author to be featured. The publishing houses got it. Immediately, 650,000 new copies of the book were ordered and Uwem became a bestselling author practically overnight. Now let me state right away and for legal reasons that this book is not for the faint hearted. The stories alone are mind-boggling material to absorb, then factored in the narrators are children; it is a very difficult pill to swallow. In “An Ex-mas Feast” young boy, Jigana, tells the story of his family’s life in a shanty makeshift home on the streets of Nairobi where his 12yr old sister, Maisha, works as a prostitute to help the family survive. On the night before Ex-mas, she leaves with white tourists who pay her to have sexual acts with a monkey, so the family may have enough to eat. The family sniffs glue to keep hunger pangs at bay and eagerly await her return. In “Fattening for Gabon” a brother and sister, Kotchikpa and Yewa, are held captive by an uncle who has sold them into a child trafficking ring for the price of a motorcycle. They are manipulated into believing it would be a better life with “Godparents” from an NGO who had previously saved their parents from ‘the aids’ and now had come to bestow their goodness on them as well. This story has one of the best opening paragraphs I have ever read, you know this is not going to end well and yet you wish it so. Also what was interesting is how no character was placed as a villain for too long. The uncle is not a bad person; he is infact very kind to his niece and nephew and loves them dearly. After the scene in which the ‘Godparents’ meet the children, you begin to hope that they maybe have better lives ahead. The poignancy in this story sets in the fact that as the reader you know right away what the fate of the children is and this makes their excitement and enthusiasm to go to Gabon ever more painful to read. In “What Language Is That?” two little girls- one Christian one Muslim- are best friends until religious intolerant adults around them threaten to tear them apart. They do not understand why they are suddenly banned from speaking to one another and as a result have to develop a secret language in order to communicate. In “Luxurious Hearses” 16yr old Muslim boy, Jubril hopes to escape the ethnic violence that has destroyed his city and as such disguises himself as a Christian so he may board a bus to safety. This story was the most difficult to read and in an oxymoronic way the most enjoyable. Maybe it’s because I am Nigerian, and so understood the lingua franca better than in other stories. Jubril himself is a conservative Muslim and so battled with mannerisms the entire story. Situations such as women arguing with men disconcerted him, because where he grew up women weren’t allowed to ride on the same motorcycles as their fathers, husbands or brothers. Where he grew up single women were given a three month ultimatum to marry-even if it meant being third or fourth wives- or face losing their jobs. Where he came from he had participated in fire-bombing churches alongside fanatic friends. The length of the story you hold your breath, praying he reaches his destination. Every time he is asked a question, you hope his Hausa accent does not slip out. Every time he is jostled by a passenger you hope his amputated arm does not poke out of his pocket. Like I said the most difficult and enjoyable to read…I like to think this is where the title of the book is derived from. I guess what troubled me was the fact that although the book is fiction; the stories are real. Heart breaking works of fiction that parallel real lives for children in Africa. They are absent of sentimentality and contain nearly unbearable-to-read violence toward children. His stories span Africa and as a result the book is a multilingual patois. Quickly you must acquaint yourself with glue-sniffing, brush up on your French, remind yourself of the constant threat of living in diverse religious areas and realize that Hotel Rwanda was not just a movie. Uwem’s gift is his open-mindedness, abhorrence of tribalism; he is comfortably able to inhabit the skin of others. The tales of horror are filtered through the wide eyes of the young as they observe the happenings around them, process the pictures they see but do not understand. They lack the words to express it and he cleverly speaks through them. Thus intensifying the horror they go through and shining a beacon of the unyielding hope that African children are inherently blessed with. UMEM AKPAN studied philosophy and English. He was ordained as a Jesuit priest in 2003 and has an MFA in Creative Writing from the University of Michigan. Say You’re One of Them is available at the one and only Amazon. Great review.. really nice.. Did you read my last two posts? And aren't you interested?Please send me a mail.. I read Exmas feast online and that turned me off the book. Good review though, I might give it a try. How is it possible that i didnt knw abt this book?